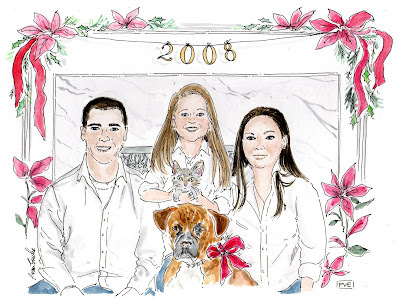 Here is the holiday card that I sent along with a 2009 calendar. Several years ago, we had tons of snow and made igloo after igloo. It is so easy, take a plastic box and fill with snow and build round and round. Happy to send you a card with a calendar. Simply contact me, e-mail me with your address and I shall be happy to send. Nice to have a calendar by your phone or at your desk or even in the car spreading peace where ever you go. Here is my infusion of green, like having a cup of fresh steeped green tea. It came from here. See my lovely hand blown glass ornament hanging in my kitchen window. I have a thing for green. It is one color that goes with everything. Each day I look at this pretty and think of her. She sent it to me. How sweet, an in-fusion of warmth and light to my day. 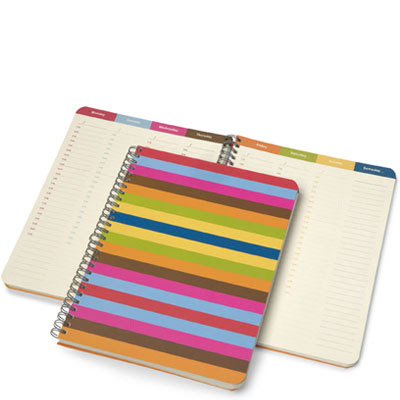 My plans for the New Year will be with proceeding with this wonderful planner " Eight days a week" from Bob's Your Uncle. I found this at a nearby paper shop and am in love with the slim portable size and the layout. Each day is a blank list from 7:30 til 6:30, in half-hour slots. Day eight is marked "someday" which I use for future plans. I really love this book and you can find it online here. You can write in the dates for each week, beginning where you want to get organized for 2009! How are your New Year's plans coming along? Time for nature, a wintry walk, some skiing and building fires, puzzles and playing games. This one I took from the inside with the screen in front and quite like the misty morning here. Take time for nature and enjoy your weekend. One of the simplest ways to spread cheer during the holidays is to send a greeting to show those near and far that you are thinking of them. 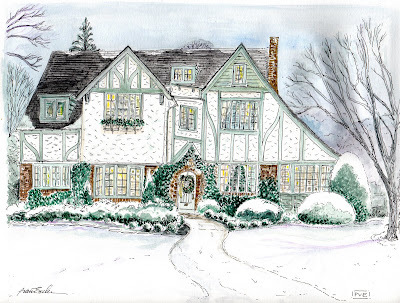 With each Christmas greeting that I draw, write and receive - it is a small way to spread good tidings of comfort and joy. 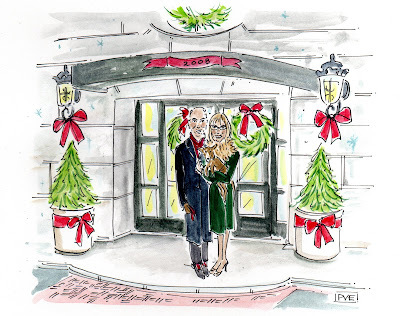 A greeting that I illustrated, proudly displayed on New York Social Diary. 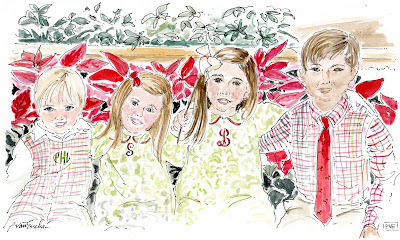 The above holiday card, I did for one of my favorite blogging buddies. Proudly, this card is displayed on New York Social Diary! All creatures, great and small, in front of the mantle for a holiday card illustrated for a delightful client. Thank-you! Greetings to each of you - near and far. 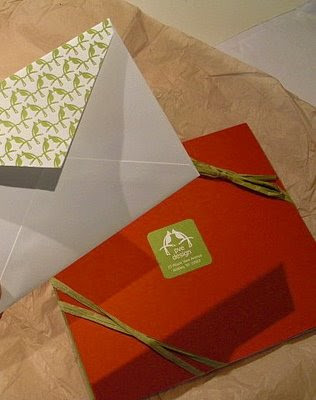 Above is the letterpress envelope that I send with finished matted artwork. My dear brother-in-law designed the logo of the birds which I love. 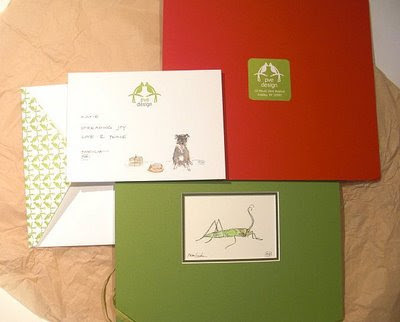 Mr.Letterpress made the envelope and cards. The paper is thick and rich and lovely. This one was sent to a fellow blogger who inspires me with her passion for decor and for making daily life more beautiful. I remembered last year that her dear dog had a good time with a box of chocolate and thought she would enjoy a small drawing which I did on the card stock. I love the color green and red during the holidays. Green goes with every color. 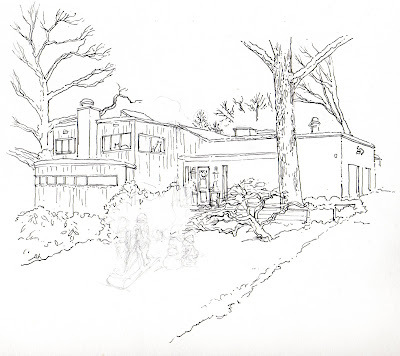 Next year, I am going to send out a drawing each month to one lucky winner, so stay tuned for details. For now, it's a wrap. Enjoy the holidays with one another and please know how thankful I am for each and every one of you who come to me for art or for amusement! Wishing each of you merriment and peace. We all know the type of place that is "gated" and causes one to stop and stare. A wrought iron gate has always held curb appeal for me. There is a certain charm of the barrier without being uninviting. 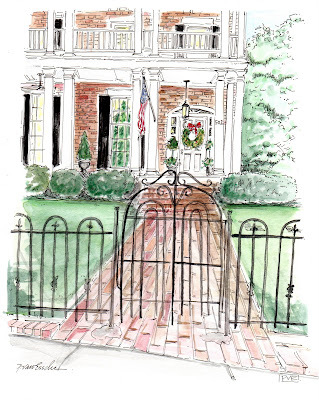 This gate says, "welcome" - come in for some holiday cheer, a cup of eggnog perhaps. 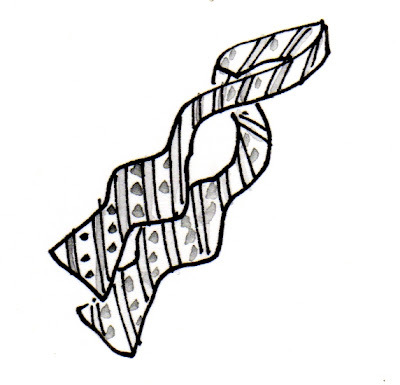 "Wrought-up" - and stressed out with all the holiday wrapping and doing, please push open that gate, ease on down the brick path to a gentler and kinder time. A time to make merry - leave your cares at the gate or better yet, leave a comment. Are you "checking it twice"- your shopping list that is. 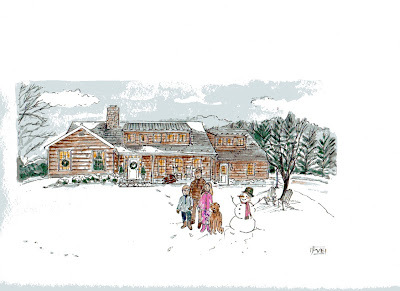 With only a few days til the Holidays, each of us are ticking our lists, mailing cards, giving gifts, and making merry. Are you shopping "on line" or in shops? 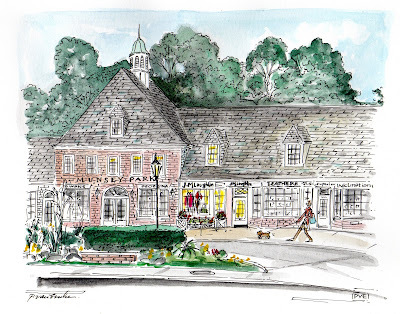 Tell me your favorite shopping spots as I would love to gather a list for a holiday shopping guide. "Don we now our gay apparel, fa la la, la la la la---"
Wishing each of you much joy - all year long! When I was asked to do the drawing for the holiday card for this dear friend of mine, I thought of all the things that she does for me. Truly, she is the kind of lady who does things effortlessly to spice up your life. She has traveled and lived in exotic places and she even has an exquisite look and style to prove her international prowess. Our first meeting was "sketchy" as we met at our local library long ago, however it was not until our wee ones went to a tot stop, that we began to get to know one another and our children got along well too which always adds fuel to the fire. If you look closely, on the sled are the "twins" which we loved sharing stories about. Only a mother of twins can relate to double duty and double dipping. Then along came the third child and I remember visiting them at the hospital and smelling that newborn and taking great delight to be the chosen "Godmother." At Christmas mass, we invited them to share Christmas. We enjoyed a day of tasting and talking and passing that newborn around. It seemed like the very next day, they were relocated to Paris. When she was gone, it truly felt like someone had removed the spice from my day or forgive, the pun, someone had moved my fromage. 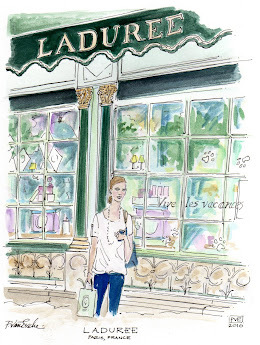 While she was living in Paris, I worked hard to get my web site up (and my friend would ask, "Is it done?") 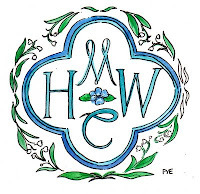 and to focus on my business, hence my friend back came back to America before I was able to visit her in Paris, alas- my site was finally up. I was able to live vicariously through her with each and every e-mail and photo attached. Each of us have friends who encourage, inspire, and motivate us to do our personal best and to make life taste better. My husbands childhood le crueset fondue set has been upgraded to an electric one, thanks to my friend. Better fondue, never knew it was bad! Cheese in any form is good to me. 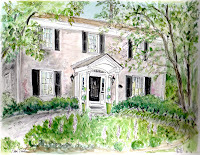 Now I am going to encourage my dear friend to build a business (or a blog) based on her many talents. Surely, what ever she does will be done with a zest of cardamom, cheese, curry and class. Just look at this bright bunch - all decked out in matching ensembles as they anticipate a visit to greet Santa and give him their wish lists. Simply give this fine lady a hand for successfully preparing this troop in their Sunday best. I could not resist capturing those sweet things in an illustration. Christmas in the eyes of a child or parent is truly special. 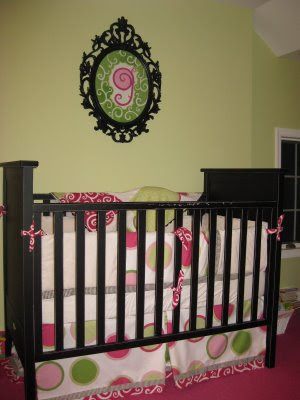 Yesterday, my blogger buddy and neighborhood friend posted this swell frame with a hand-painted "g" for her little princess. 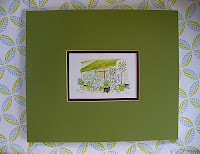 She contacted me with this request and gave me the frame along with the quilt and I began to paint. 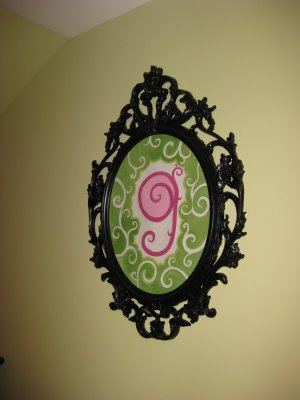 When I saw the frame she had, I immediately thought "goth" - I have seen several other blogger buddies with this frame too. I love the way everyone makes it their very own. 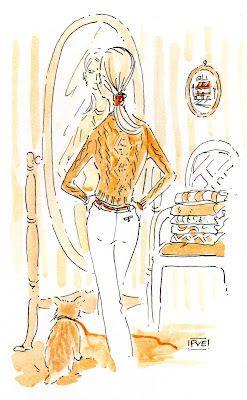 pve design illustration, mirror mirror -which sweater is the fairest of all? Why, just the other day, I went for my scheduled salon appointment for a hair appointment here. To my surprise, my visit was "complimentary" as I really just needed a "snip" here and there. In a matter a minutes, I was out the door on my way with my to - do -list in hand. I thought to myself how compliments really do go far. While I realize this is not an every day happening, but a "shear" treat during the "bah humbug" holiday errands. Think about it and surprise someone with a complimentary "compliment"
or a small token of appreciation. How often are you paid a compliment and or something complimentary? When was the last time? 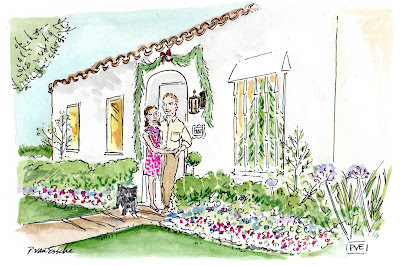 Many doors and doorways are decked with garland, fir wreathes or spruced up urns to ring in the season with style. What could be simpler than that of a wreath and a garland to easily add the feeling that holidays are honored inside. 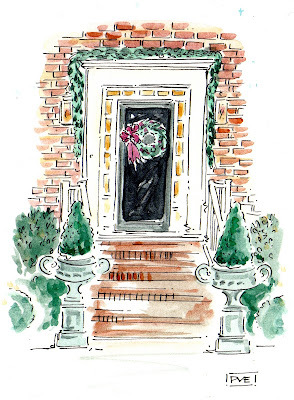 I have always adored a garland or a swag simply gracing an entry or decking a door. Time to deck the halls with boughs of holly, fa la la! 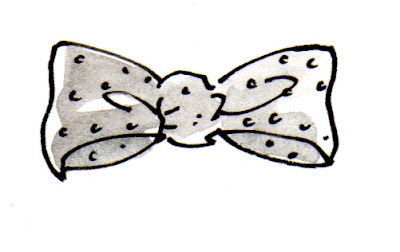 There is something quite dandy about a dude dressed in a bow tie. My dear Mr.PvE has been known to wear one around the holidays for an added festive touch. I like a man in a bow tie, there is something quite special, a smart elegance in an understated way - (and I am not talking about the clip-on sort.) 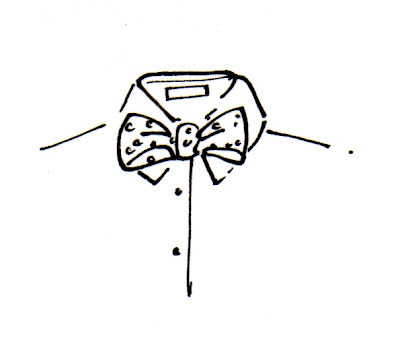 Give me the old fashioned bow-tie to make one handsome beau. Worn with a black tie, or sporting one paired with a bold striped shirt is an easy way to look spiffy. Get ready to tie one on. Part therapy for me during the holidays is to bake cookies, it is an easy thing to do from start to finish and is what I like to call, an instant sort of gratification. Some things I do just take lots of patience but baking a bar cookie is easy. Give this recipe a try, your home will smell so good too! Mix butter and sugars til fluffy, add eggs, vanilla, gradually add in flour, mix and fold in the chips. 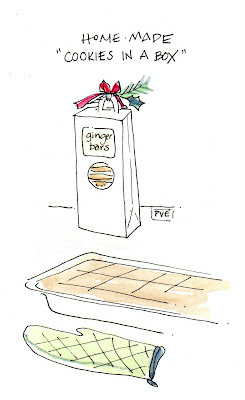 Spread batter in a 9 x 13 pan lined with parchment paper - overhang along the edges - which helps for an easy clean up. Bake 40 to 50 minutes in a 350 F oven. I learned to cut them into squares with a plastic knife while hot, which really is easy! I found boxes at the container store and tie with a ribbon and greenery! Cookies during the holidays make everything sweeter! 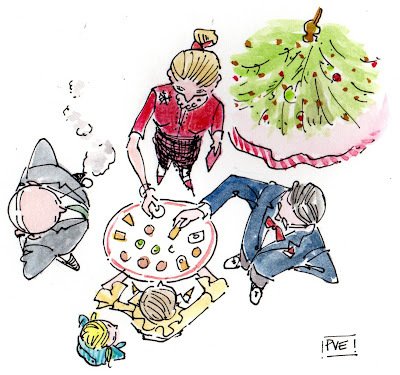 illustration by pve design, "the holiday hors d'oeuvres platter"
Ever since I was a little child, "hors d'oeuvres" have always been one of my favorite things about a party. Perhaps I just like the way the word itself sounds, very international or perhaps because it sounds very grown up. 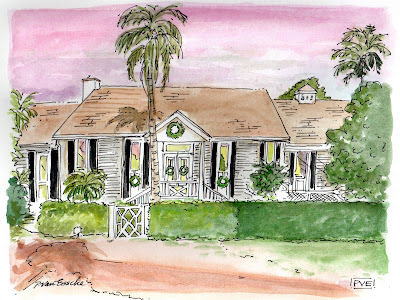 During the holidays, my Mom and Dad would host an at home Holiday party which usually consisted of my Aunts and Uncles. I remember my Mom making lots of goodies to pass around on a large platter saying "hors d'oeuvres" in her lovely Kentucky accent. I would be instructed to get ready for "beddie-bye", I would usually have to change into my pajamas with padded footies and then come and say goodnight. My Uncle Don loved teasing me. He would bring these animal shaped erasers with the jiggly eyes and then slip them into my pajamas and I would run and laugh. I would sneak an hors d'oeuvre and a good night kiss before I would go to bed. I hated to have to go to bed, knowing that everyone was still there having hors d'oeuvres and laughing. Do you have any funny childhood memories of the holidays that make you laugh or perhaps make you hungry? Is the "miser" in you or the "cheap skate" coming out due to the economic climate that we are currently weathering? Frugality is an art and many a millionaire have been credited for their thriftiness. However, t'is the season to give, to share and to skate. If you have limits as to what to give for a mere $10.00 - what would you give to bring some holiday cheer? Love to hear your ideas that fit into my budget. "Rock Center" - located in New York City is the best spot to visit, to skate, to see the tree and to feel the magic of the holidays. Do you have a spot where you live that rocks during the holidays? The holiday season truly is a time for all to embrace their inner child and enjoy the wonders of the season. Children along with pets are miracles. The love they bring is so innocent and pure. 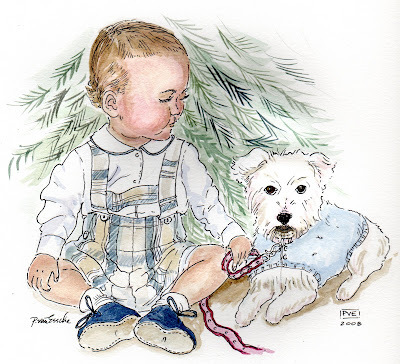 The above wee lad and lassie are going to grace a special holiday card and surely spread the joy of the season. What are your favorite memories of the season that release childlike qualities in you? Very often as an artist, certain "things" or elements catch my eye. Lately, I seem to be on "safari" of sorts and loving elephants. I spotted the one above on e-bay from Hermes. Would that not be sweet dangling from a cord, worn as a choker during the holidays. 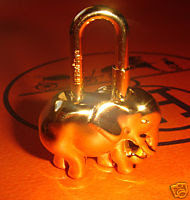 This sweet golden elephant is from here, it said sold out, but surely there must be more elephants somewhere like this one. 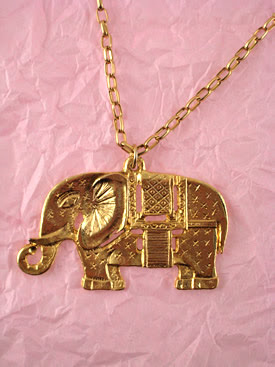 He has an "Indie" vibe with his trunk up and the tiny motif forming a pattern. 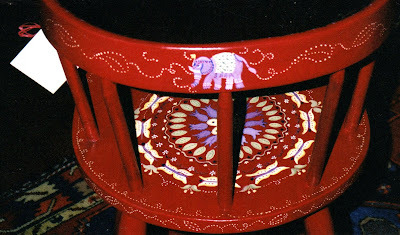 The tot chair below, I had hand painted several years ago for a child coming from India and I remember thinking that an elephant would be a nice welcome. 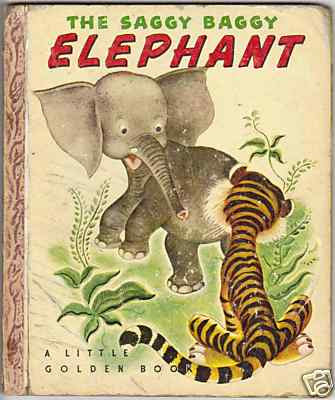 Children love elephants, and as a child, I loved this little golden book along with Babar. 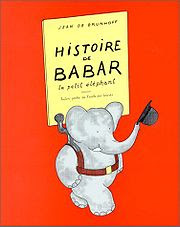 I adore the drawings as well as the fact that Babar wore a "green" suit. 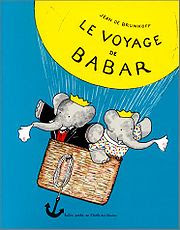 Babar would take me away in the stories as well as the drawings, on one of his many "voyages." 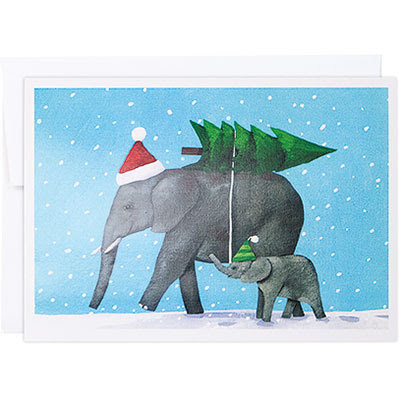 How sweet is this holiday card with Mommy and baby elephant bringing home a fresh cut tree. Are you currently craving elephants or any other creature? 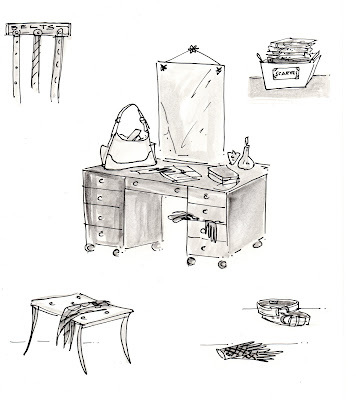 "Accoutrements" are just the sort of paraphernalia that can add pizazz to one's day. My plan this week is to take inventory of my accessories and add a twist as I scout for some new or vintage finds. The perfect bag, belt, boa, scarf, gloves, or jewelry are all you need to be pulled together. 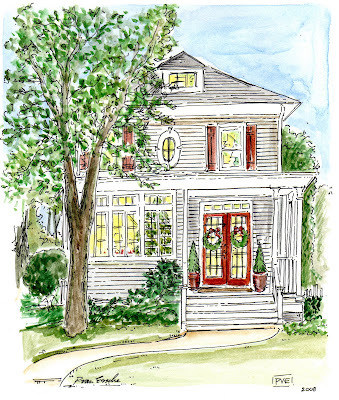 All things organized for easy access as you dash out the door to spread holiday cheer. What is your favorite accessory for the Holidays? Love to know how they are organized? Yesterday we had the excellent fortune of attending "The Nutcracker" at Lincoln Center. One of my favorite dances of all times. I adore the music, the set, the costumes and the dancers who dedicate themselves to dance. We awoke to snow falling and it continued to fall in this dance which was magical. Uncle Drosselmeir is atop the clock casting shadows that frighten poor Maria (or Clara) as I remember from seeing this as a child. 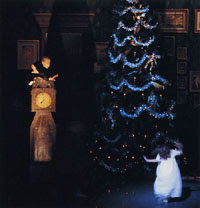 The Christmas tree that grows is also a magic moment. 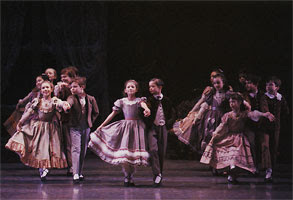 My favorite scene are these elegant children at the "party scene", making merry mischief. A dear friend has two sons that are dancing and we were able to see them on stage. 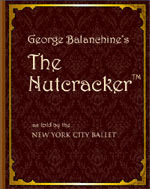 It is a tremendous feat to make the cast of the Nutcracker as well as perform many shows a during the month of December. I commend the parents who dedicate themselves to providing such and enriching cultural experience in any of the arts. What are some performances that make your holidays merry and bright?